Happy Easter! 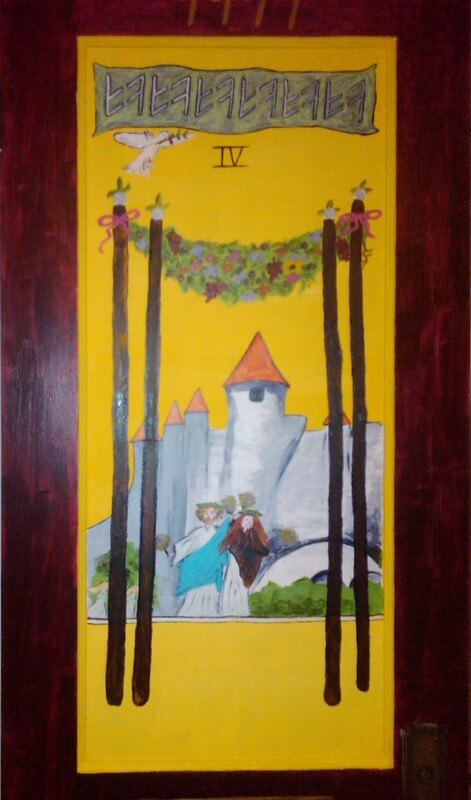 I haven’t actually finished Door Number 4, but the front is done, so I thought I’d post before the holiday. 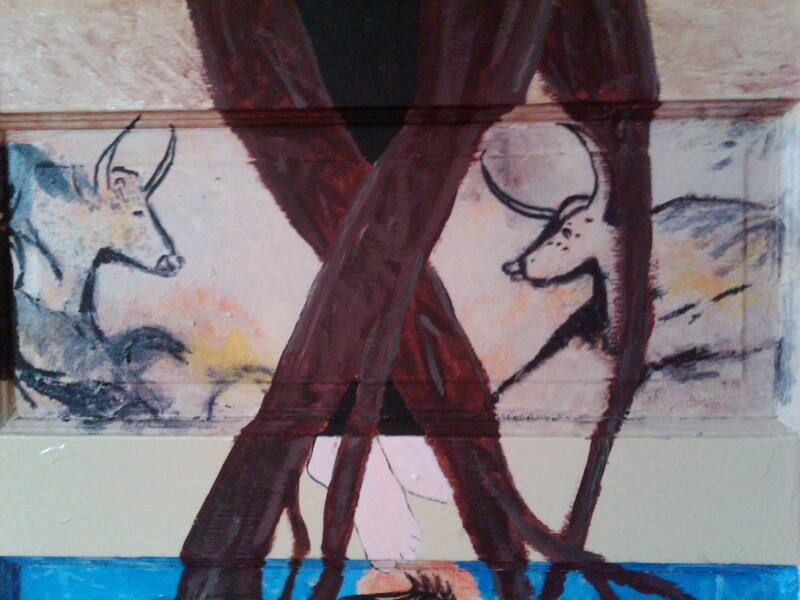 This one features a version of the Rider-Waite Tarot card for the Four of Wands. 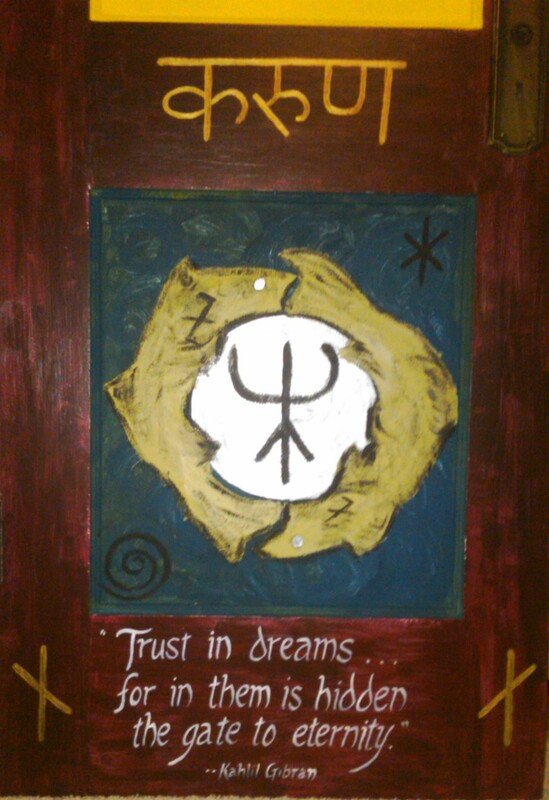 The bottom quote is by Kahlil Gibran: “Trust in dreams for in them is hidden the gate to eternity.” I kept dreaming of “the 30th card in the Tarot” until I finally remembered from Tom’s reading in Schizandra and the Gates of Mu that the 30th card is the Four of Wands. 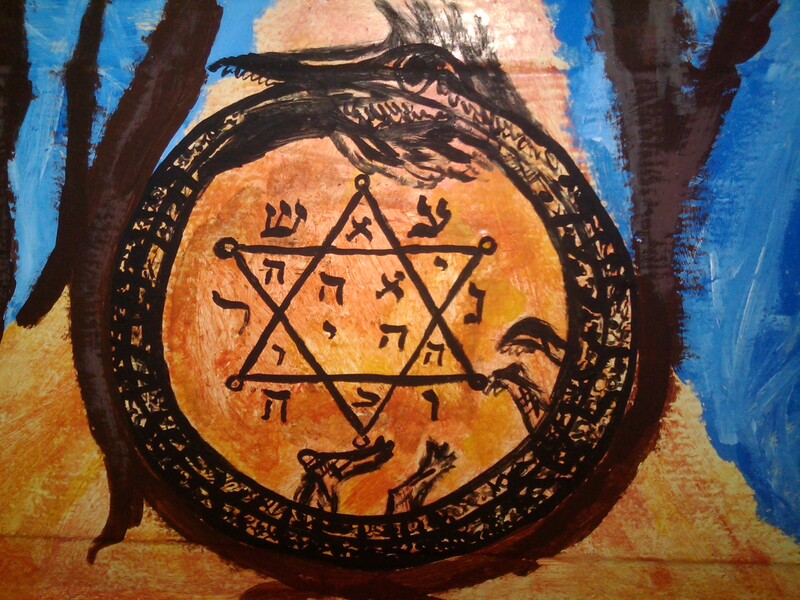 The image worked for me with a few tweaks, as I had also been dreaming of some specific combinations of Runes that came together in the shape of the couple with their arms at those angles. LOL, very active dream life lately! And … as a special treat … I have a before picture! This is what I started with. Well, it’s actually a heavily cleaned version of what I started with. 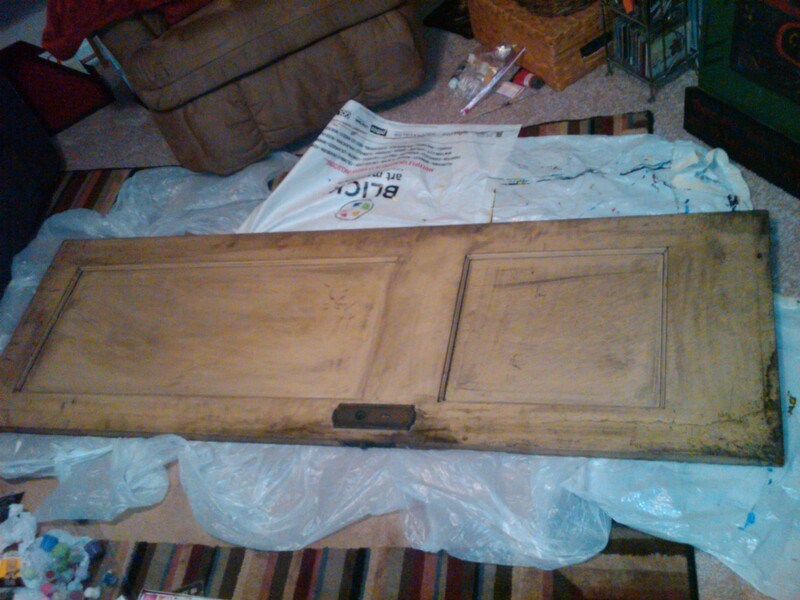 Below is the back before priming it, and believe it or not, the front actually looked worse! 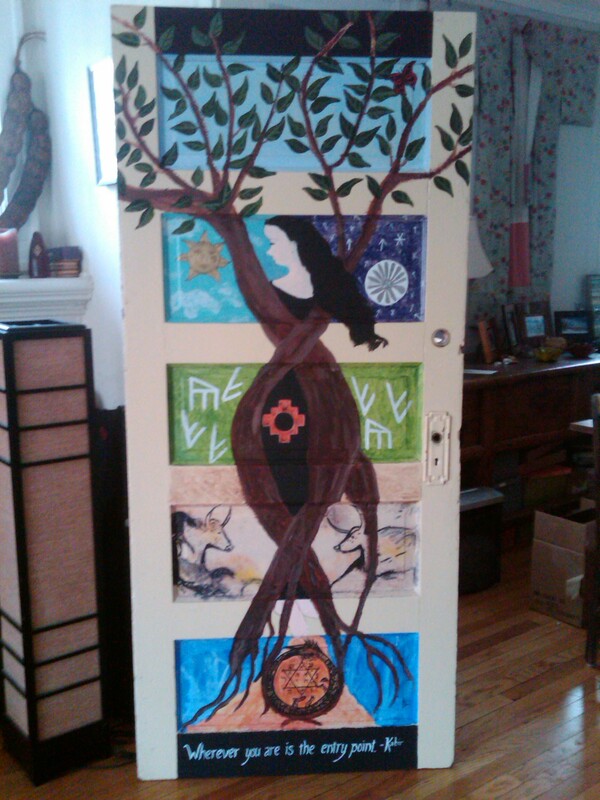 Perhaps you can see why I consider painting these doors, or portals, as part of an alchemy process. I might not be turning baser metals into gold, but some of these doors arrive in pretty grim shape! I like to think we can transmute ourselves and our reality into whatever beautiful things we can imagine. 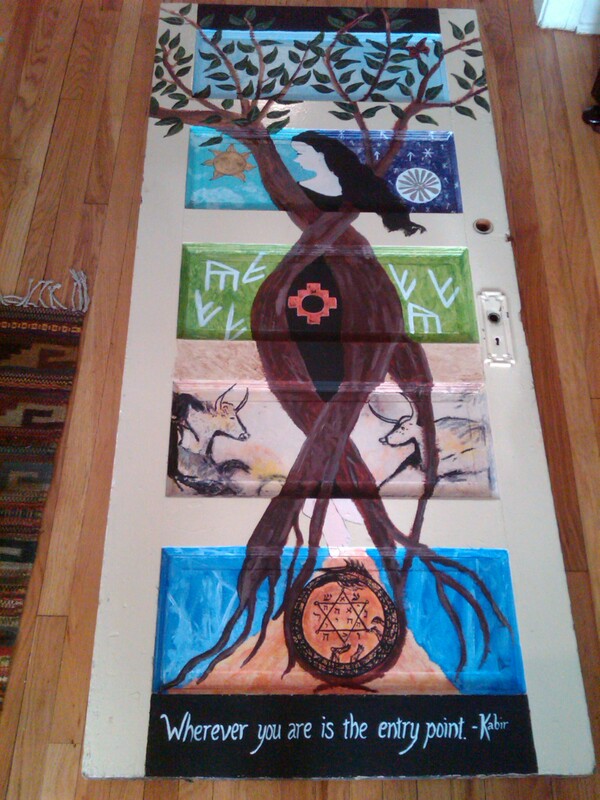 Some of you know I’ve been in Evanston all week, painting a door rescued by my friends Wendy and Matthew. They left it for me in their laundry room on their way to Peru to swim with the pink dolphins and pirahnas. (I’m really not making this up!) I have a key to their apartment and an open invitation, so I arrived here the day after Spring Equinox to find keys (to the laundry room) and a giant, antique door that possibly weighs more than I do. Wendy’s downstairs neighbor helped me haul it upstairs and I worked on it all week while listening to sacred chants and wearing a moldavite pendant. Lots of energy shifts! 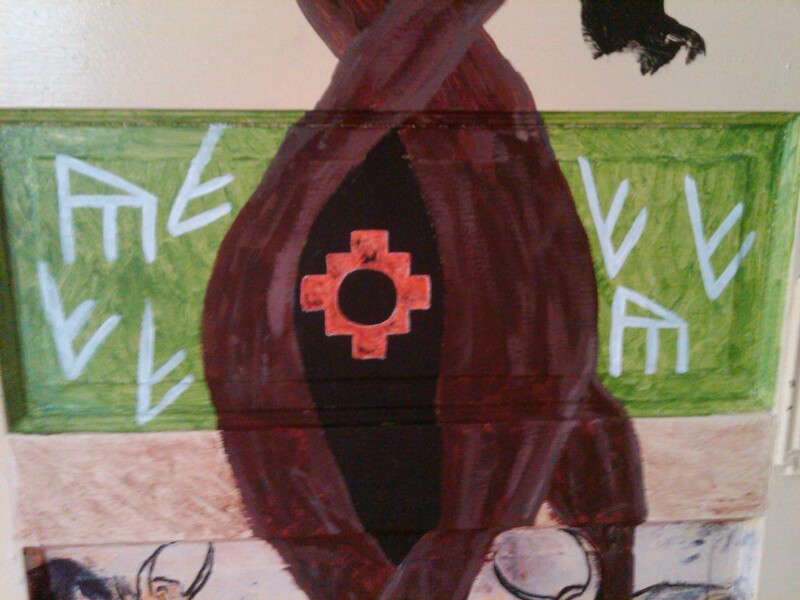 This one looks more like a painting than the other doors, but it is actually even more “coded” with Runes and other symbols. I just worked many of them into the textures and decorative details. 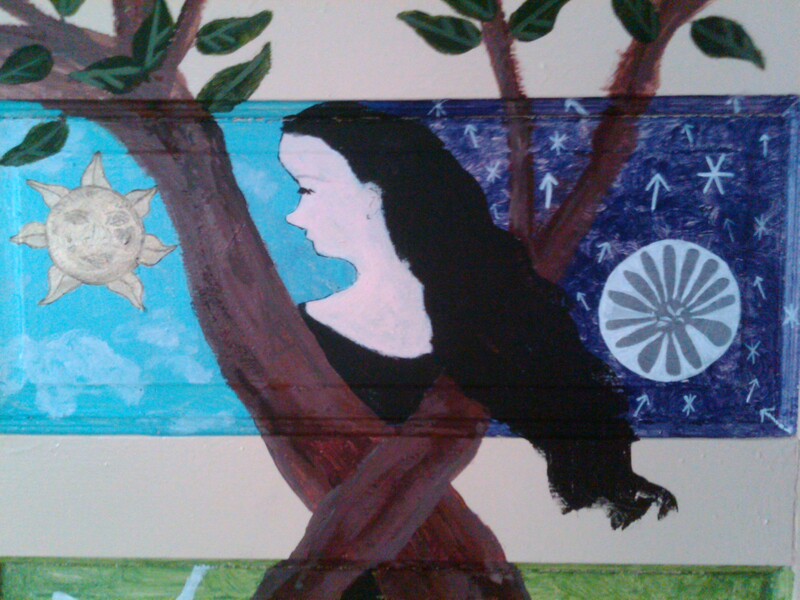 The main theme is a “World Tree” or “Tree of Life” with the wood nymph Daphne turned into the Laurel Tree. Apollo loved Daphne and when she became the tree, he created the laurel wreaths/crown of laurels for poets in honor of her. 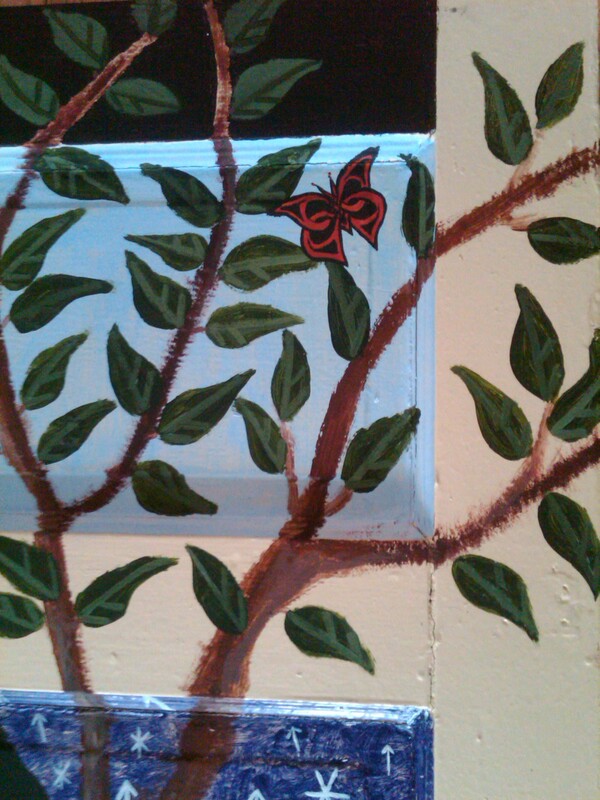 At the top right, is a Celtic Butterfly, and the bottom quote reads, “Wherever you are is the entry point. –Kabir.” Some people will also recognize the Chakana from Schizandra and the Gates of Mu. I had so much fun inserting Runes and other details, but there are too many to tell here, so I’ll just post the photo below. Please excuse the, um, less than professional look of these photographs! 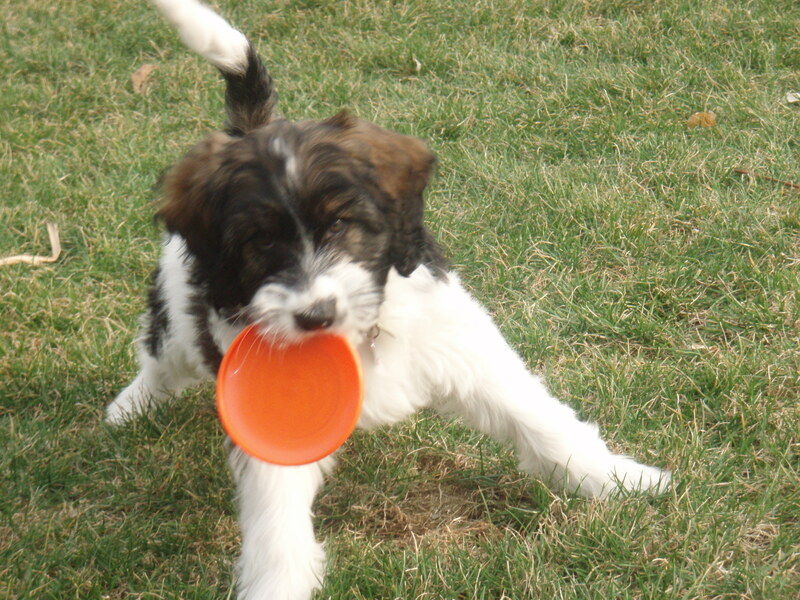 I lost my in-house professional photographer when I got divorced and moved to Chicago, so these are BlackBerry images. I’ll eventually replace them with better quality photos from a wide angle lens, but I wanted to share them now. 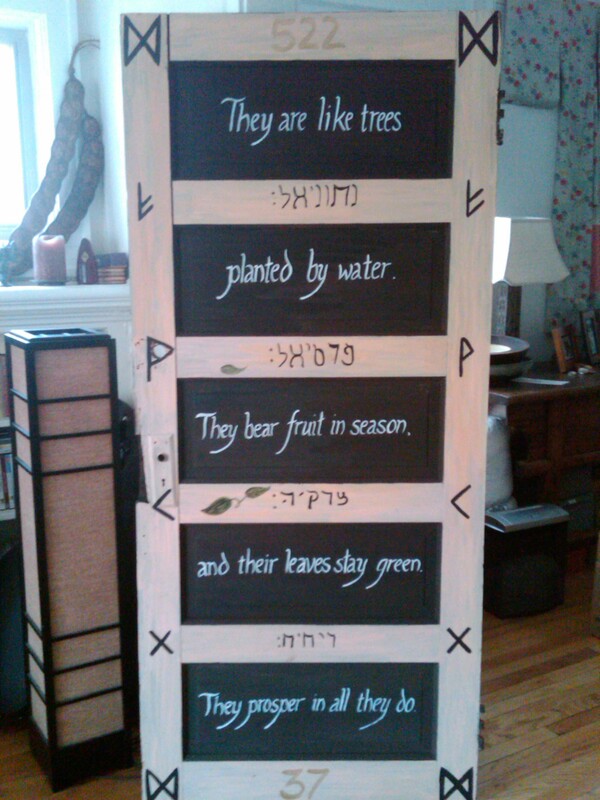 Several people have asked if I plan to sell these doors. The short answer is, “No, not these particular ones.” They are very personal for me, and I want them in my home; however, I do intend to create more doors for sale. LOL, I am running out of room in my apartment for all these giant doors! Price per door varies, depending on size, desired degree of detail and whether you would like images on both sides. In some cases, I’m willing to travel to you, but that’s on a case-by-case basis, depending on my schedule, available accommodations, number of doors, and your location. If you’re interested, please feel free to email me at brunoleaf at yahoo.com for more details.